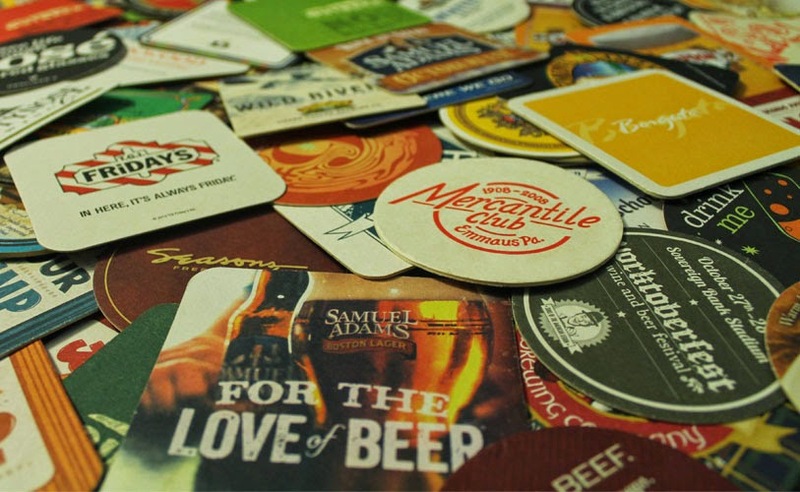 For years, I have been collecting drink coasters from all over and have managed to assemble quite a few. Some I've obtained thanks to friends and family and others from my own pursuit. It has become a habit of mine to stick them in my purse before I've even gotten my drink. While some patrons would choose to steal random things from their table like butter, condiments, creamer and other goodies, (even salt shakers or cups... it happens, people!) I'm the crazy lady who's stealing the coasters that would normally be thrown away. It's funny. Sometimes it confuses the server but other times I've told him or her about my collection and they think it's cool. I just think it's fascinating how coasters can serve the purpose of being a mini-advertisement or just be plain decorative. Some jump out at you with a vibrant color. Others have clever or funny things written on them. A few even interact with the customer, prompting them to go to a website or maybe try a featured food or drink item. At the end of the day, they ultimately exist to keep your drink off the table but it's cool to see them serving a higher purpose through their individual designs. What do you collect? Do you have a display for your collection? I LOVE the new look. Also, I will start pocketing coasters for you! I have never thrown away a wine cork, and you know I drink a ton of wine. We have hundreds of corks, I'll do something creative with them eventually! Thanks so much, Alyx! I actually just pinned a cute idea for decorating with wine corks on Pinterest (http://goo.gl/X3WS8P). My parents have a surplus of them too and one year I made a decorative wreath from them!